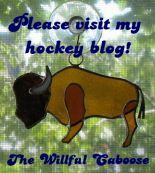 Most of you know that poor little Oh For Fun suffered mightily after I started my hockey blog, The Willful Caboose. Well, guess what? There is no hockey in the summer! None at all! I've decided to broaden the scope of TWC (at least during the hockey offseason) to more Oh For Fun-like fare. If I think I've got a post on TWC that you guys might enjoy as well, I'll post it on Oh For Fun as well. But the new content won't be here, at the old Oh For Fun. It will only be here, at the NEW Oh For Fun. This will be the last post ever at the old digs!